Sulcata tortoises are the third largest tortoise species in the world, after Galapagos and Aldabra tortoises. 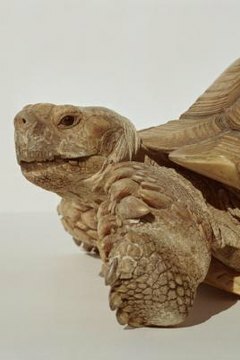 At full growth, a sulcata exceeds 18 inches long and can weigh as much as 100 to 150 pounds. UV rays produce vitamin D3 that helps your tortoise develop his large, rapidly-growing shell. Allow him outside for a minimum of 20 minutes per day or give him a UV bulb in his enclosure for 10 to 12 hours per day. UVB rays vital to vitamin D3 levels do not pass through glass, so you'll need to provide a UV bulb when keeping your tortoise indoors. Position the UV bulb at one end of your sulcata tortoise's environment about 12 to 18 inches from the top of his shell when he is resting in the basking area. Be sure to provide a den-like environment where he can take shelter when he's done catching rays.